The Government and Minister Bruton decided today to close over 400 secondary schools and lock out both teachers and pupils. They did this because they want to punish the ASTI for daring to seek equal pay for newly recruited teachers and for wanting to be paid for the hours they work. The ASTI are the only union to fight for immediate pay equality in the public service. All public servants recruited since 2011 are paid significantly less than their senior colleagues. New teachers can earn around 8000 euro less for doing the same work. The Government want to stamp out the example of workers standing up and fighting for a basic union principle of equal pay for equal work. 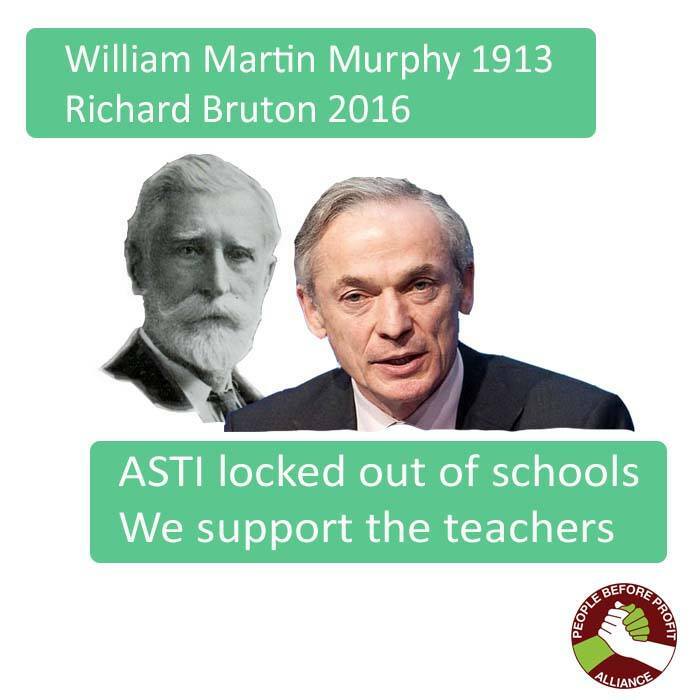 It is Kenny and Bruton that have closed our schools, not the teachers. While they are willing to pay teachers in other unions for doing supervision work they expect ASTI members to do it for free. The only sin that ASTI members are guilty of is demanding equal pay for all their members. We must not let this Government attack on the ASTI succeed. Their tough stance toward the teacher’s simple demand is in stark contrast to their grovelling to bankers, bondholders and the troika when they paid off the banks debt by slashing public services and hiking all workers’ taxes. Parents, pupils and all trade unionists should demonstrate their support for this fight. People Before Profit stand 100% behind the teachers in the ASTI and the many thousands of teachers in other unions who fully support them. Bríd Smith stated last night: “The cost of full equality for all teachers is estimated at about 70 million euro. The Government talks of recovery in one breath, but then it says it can’t afford such demands. Yet they can gift tax breaks to corporations, landlords and the wealthy worth over 100 million in the recent budget. They won’t pay the teachers demands because they want the recovery to be a recovery of profits for the wealthy, not of workers’ wages”. November 7, 2016 in News.